If you are one of those coffee aficionados searching for a brewer that will offer you both functionality and value for money, look no more. The Behmor Brazen Plus Temperature Control Coffee Maker manages to do all that, and even more impressively, boasts an outstanding design and technology that surpasses that of any other coffee maker in its class. Of the several mind-blowing and innovative features of the Behmor Brazen Plus, the variable temperature control and the SCAA certification are possibly the most significant. In fact, it is one of only 6 SCAA Certified home brewers available at the moment. 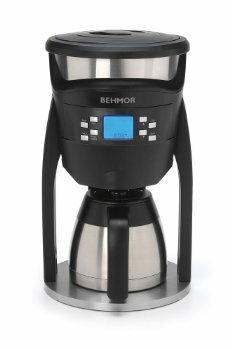 The new improved Behmor Brazen Plus Customizable Temperature Control Brew System comes with numerous significant tweaks since the Brazen Brew System was first launched. It also gives you the ability to mimic a manual pour over coffee brewer if you want, except that you don’t have to tend to it at all. Standing at 9.2” X 9.2” X 15.2” tall and weighing 10 pounds, the unit features a rounded top, cylindrical stainless steel pedestal, and a three-legged body. This machine is no usual coffee maker and looks more like a Sci-Fi space marine helmet. At first glance, the Brazen Plus might look like an all-plastic construction and you might feel that you have thrown away your money. Surprisingly, that is not the case. Once you open the water reservoir at the top, you are met by sparkly, stainless steel lining on the inside. This feature will definitely make you smile. Plus, it is all BPA-free plastic everywhere else. It comes with a 40-ounce, 8-cup, 1.2-liter capacity. The 1400 watts of power is conducive enough for hitting the right water temperature in a reasonable amount of time. With various programming capabilities, the Brazen Plus is engineered to offer superior control over features such as allowing the user to adjust the altitude calibration, the temperature of the water and the pre-soak settings in order to make a wonderful cup of coffee just as you have always wanted. Compared to most other coffee makers that employ a rigid method of heating with an extensive variation range, this machine allow users to set specific brew temperatures at which the water will hit the grounds. All you will have to do is hit the mode button and select your desired temperature range that is set between 190 Fahrenheit and 210 Fahrenheit (with a 0.5-degree variation). Since various characteristics and flavors of coffee have a propensity to materialize based on the degree of hotness that the coffee is brewed at, controlling the water temperature is vital towards creating the eventual flavor profile. In addition to the variable temperature settings, the Brazen Plus comes with a Pre-soak element that allows users to wet the grounds for a particular period of time- usually between fifteen seconds and four minutes before brewing. The pre-soaking function allows for even saturation and “blooming” of the coffee, especially for freshly roasted coffee. The fresher your grounds are the longer the time you will require for pre-soaking. The shower head is large and the water flow is pulsed to ensure complete saturation of the coffee grounds because of the agitation that it creates. Another innovative feature of the Brazen Plus is the temperature altitude calibration. This feature allows the machine to be calibrated at various altitudes. Water boils at 100 degree Celsius at sea level, however as the elevation rises to a few hundred meters the boiling point lowers. The calibration feature of the Brazen Plus allows you to set the temperature limit based on the altitude. This means that the Brazen Plus calibration optimizes and corrects the system for altitude. Most coffee machines in this class have not reached this level of accuracy and technology. The Brazen Plus comes with a programmable clock and timer that allows you to brew at a pre-determined time, for example, in the evening after work or in the morning after waking up. All the settings are saved in memory excluding for the clock itself. The water reservoir is also the boiler, as the heating element is under it, and is easily accessible to fill, so all you have to do is look inside to see if it needs descaling, which is unlike most other machines that use an indicator to tell you when it’s time to descale. There is also a removable screen filter inside to catch water impurities. The machine also comes with a custom-made larger basket gold filter with handle that is included as an added feature. It is also important to note that the Brazen Plus can also be used with basket shaped filter papers that are readily available. The unit comes with an 8 cup thermal carafe that’s fitted with a brew-through lid. This lid design minimizes heat loss as the carafe is being filled. The unit has a manual water release feature that comes in handy when you want to do away with the thermal carafe and brew directly into a manual pour over coffee maker, like a Chemex or Hario. This is one of those extra features that is not obvious from other coffee makers. It is however important to read the manual for instructions on how to use it and when. Along with its comic resemblance to a futuristic spacecraft, its user-friendly structure, and the stainless steel construction used for both the reservoir and the carafe, it offers a mixture of benefits such as equipment sturdiness, superior taste guarantee, far-reaching ergonomic efficiency, and superb temperature regulation, that eradicates the need for a hot plate. It has adjustable feet to offset kitchen counters that are not properly leveled. It makes superb tasting coffee. It comes with a programmable wake-up timer. The variable temperature range management allows for selecting your desired brewing temperature. The carafe spout is well designed to reduce spillage. The unit is SCAA certified. It is a good buy if you want a machine that most closely mimics a manual pour over. The unit has a long brew cycle – around 6 minutes. It has a small carafe capacity (it can only brew 8-cups of coffee at a go), but most of the other SCAA certified brewers also feature this capacity. Condensation tends to accumulate near the reservoir and shower head and will drip down if you remove the carafe immediately after brewing is over, so it’s best to wipe it down properly first. ← What is the Best Small Electric Grill of 2018?